Pempek, Mpek-mpek or Empek-empek is a delicacy from Palembang, Indonesia, made of fish and sago (a starch extracted from the pith of sago palm stems). Pempek is served together with a dark, rich sauce called cuka (lit. vinegar) and Baso Palembang. Cuka is produced by adding brown sugar, chili pepper, garlic, vinegar, and salt to boiling water. Left: Pempek Kapal Selam, with whole egg inside. There are many varieties of Pempek. One of the most famous types is the Kapal Selam (Indonesian: "submarine"), which is made from a chicken egg wrapped within the Pempek dough and then deep-fried. Other varieties include Pempek telur kecil (lit. small egg Pempek), Pempek keriting (lit. curly Pempek), Pempek pistel (lit. pistol Pempek), Pempek kulit ikan (lit. fish-skin Pempek), Pempek adaan, Pempek lenjer, and "Pempek tahu" (lit. tofu Pempek). According to a legend, at around 1617 there was an old Chinese Man who lived near Musi river. He noticed an abundance of fish caught by the local fishermen. The indigenous people, however did not know how to cook the fish properly. During that period, most of the indigenous people simply fried their fish instead of adding in other ingredients to make new dishes. The old Chinese Man mixed in some sago and other spices, which he then sold around the village on his bicycle. The people referred to this old man as 'pek-apek', where apek is a Chinese slang for an old man. The food is known today as Empek-empek or Pempek. As a local staple, Pempek can be commonly found on every street in Palembang. Numerous Pempek sellers and producers in Palembang use a cheaper combination of fish, which has a strong scent. 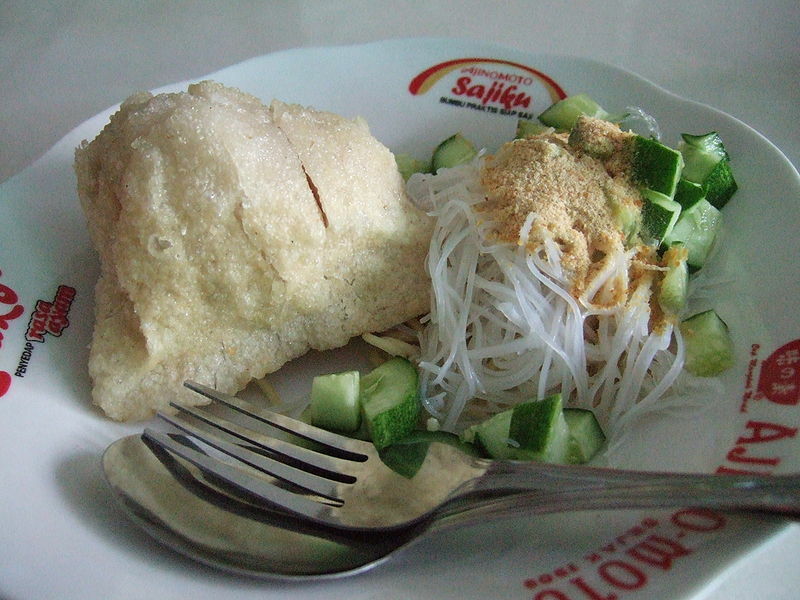 The best Pempek are made of Belido Fish and are usually more expensive.